I've been attending Expo West for the last three years. It's where you want to be if you have any interest in healthy food and products. 80,000 industry professionals attended at the Anaheim Convention Center this past year. It also sprawls to the Marriott and Hilton next door for interesting talks and additional displays from emerging brands. 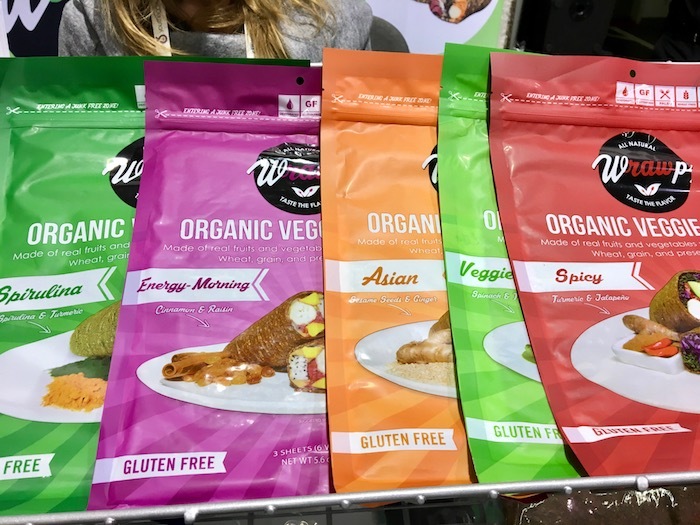 There's about 3,100 exhibitors at Expo West, and most are handing out free samples, so come hungry and wear comfortable walking shoes! Going to Expo West can be slightly overwhelming as there's so much to see, hear and sample with over 3,000 booths and dozens of talks going on at all times. I decided to just focus on food, though someday I'll have the energy to tackle all of the amazing innovations happening with the beauty products. I also went in with an eye for healthy food that is gluten free, dairy free and sugar free, just like the recipes you'll find here on Tasting Page. Here are the trends I'm seeing in the natural food world. Many of them are continuations of existing trends, but there's subtle refinements happening and since many products don't make it, it's nice to see momentum on some of these healthy products. The alternative mylk movement is still going strong. Sure, you still have your coconut, almond and hemp, but there's also some newer players in the mix now, including a few brands of banana milk! I've been enjoying tigernuts for a little while now. They're actually not nuts at all, but rather a small root vegetable, so it works for the paleo crowd. Tigernuts are a great resistant starch and prebiotic fiber with up to 40% of your daily recommended dose. This will keep your gut happy by feeding the good bacteria. 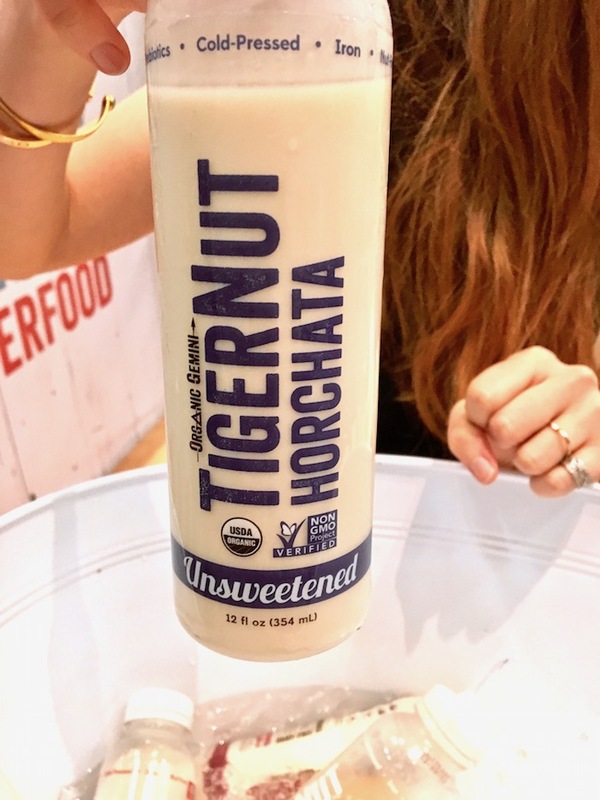 So you can now enjoy tigernut horchata. In Spain, they used to use tigernuts in their horchata, so this is a traditional recipe. Better yet, they don't add sugar, so hooray for that. One flavor includes dates, but you can also get it unsweetened. Oatly is also doing a dairy free and nut free drink that's shelf stable at room temp, but contains trace amounts of gluten. Interestingly, they fortify it, like the cow's milk people do, with calcium and vitamins like D, B12 and Riboflavin. I've tried Ripple, the pea protein plant-based milk, and have enjoyed it. Their unsweetened milk has no sugar and 8 grams of protein, 50% more calcium than cow's milk and 32mg of the all-important DHA Omega 3's. They do use some sunflower oil to get a rich texture and a little guar gum for stabilization. 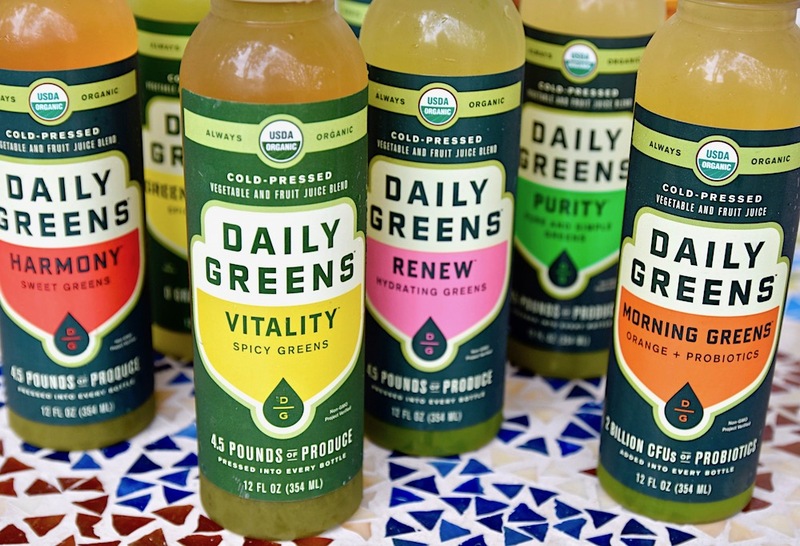 I know that I've grown pretty tired of drinking only water throughout the day, so I'm happy to see a little movement in the healthy drink category. Cactus is a newer player to the scene and I like what True Nopal was doing. There's a nopal cactus (prickly pear) in the Sonoran Desert that's been used for thousands of years. It has a natural sweetness, so luckily there's no sugar added, but it does have antioxidants, electrolytes and potassium. I think it's a better alternative to coconut water, especially at half the calories and sugar. Unfortunately Steaz uses both cane sugar and stevia in their cactus water, though they have an unsweetened tea. 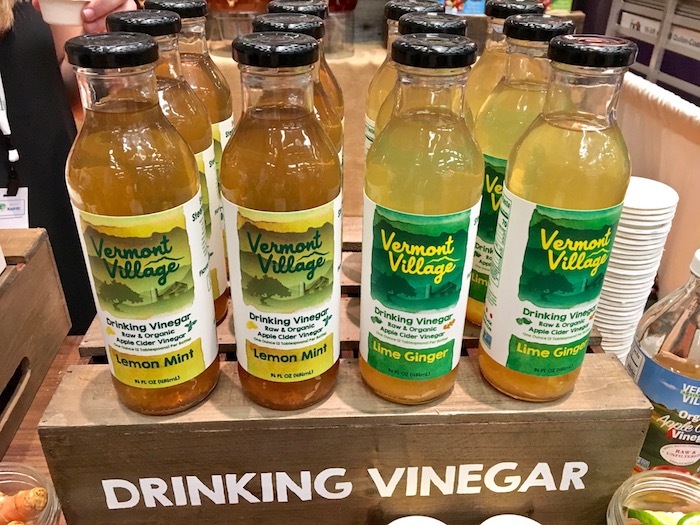 As someone who drinks apple cider vinegar every day, I'm happy to see some more palatable drinking vinegars to enjoy with a meal. In case you're not on the apple cider vinegar bandwagon yet, a swig a day helps to improve digestion, gives you a nice dose of antioxidants and can even help curb your appetite. I liked the variety Vermont Village was offering with all natural juices like lemon, lime and nice accents from mint to ginger. Yoot Tea is making some really delicious and healthy cold tea infusions. They have 3 new daily detox teas to drink that are all naturally sweetened using monk fruit and things like ginger, vanilla, cinnamon, licorice root and lemongrass. You'll soon be able to find these on Amazon. Sure, you've seen smoothies and juices galore, but there's an even heavier emphasis on piling on the vegetables in your daily drinks. I've written about the veg-heavy Daily Greens juices, but now there's also sippable soups. Zupa Noma has 6 cold superfood soups like organic cucumber, avocado and fennel, and organic carrot, coconut and lime. They're chunky and full of fiber, and contain 4 servings of whole vegetables. 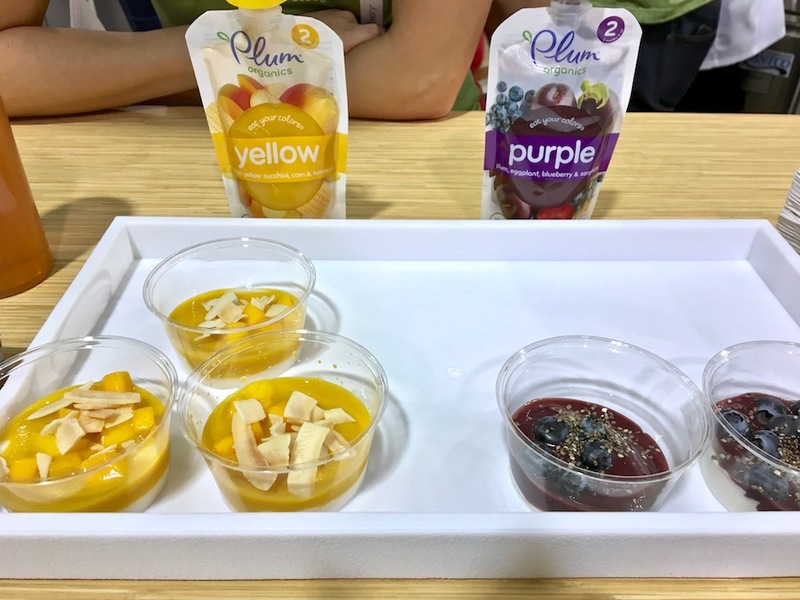 I also liked Plum Organics' Just Veggies and Just Fruit all natural blends. It wasn't until I stepped away that I realized these were actually baby food. Hey, if it's healthy enough for a newborn, it's healthy enough for adults! I love coconut, in case you couldn't tell from the hundreds of recipes on my site featuring this guy. There's even more coconut innovations going on from already liquid coconut oil (easier for cooking and oil pulling) to coconut wraps. I'm a big fan of coconut wraps and really liked NUCO's organic selection in both plain and turmeric. They only include a base of just 3 ingredients - organic coconut meat, organic coconut water and organic extra virgin coconut oil. They also have a line of coconut vinegars which is sourced from the coconut sap vinegar. A little coconut oil with NUCO's Balsamic coconut vinegar makes for a fab salad dressing. I'm also excited about Nutiva's organic MCT oil. They're the first to bring this amazing healthy medium chain triglyceride oil to market in organic form. Should be out in May. Can't wait. As I mentioned above, I really liked NUCO's coconut wraps to roll up a taco or other veggies. I tried Wrawp which has a vegetable base of apple, zucchini, and onions with flax, coconut, oregano and turmeric. It's great that they don't add any fillers, but it has a much tougher and chewier exterior than the coconut. 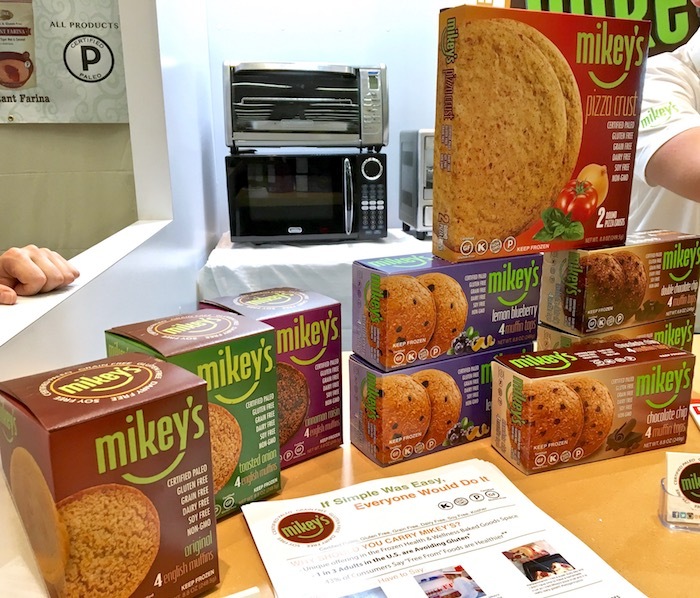 Mikey's has a nice line of paleo muffins. Their English muffins are spot-on with non-gmo eggs, almond and coconut flour, water, baking soda and salt - not bad, right? The muffins also come in cinnamon raisin and toasted onion. You can find them in the freezer section, or of course, on Amazon here. Thanks goodness we're moving away from Equal and Splenda land, but we still have a ways to go for the perfect "healthy" sweetener. I'm ok with stevia and do use it on occasion, but some people don't like the aftertaste. Sweet Leaf is still doing the best natural stevia iteration that I've seen. I use this one. 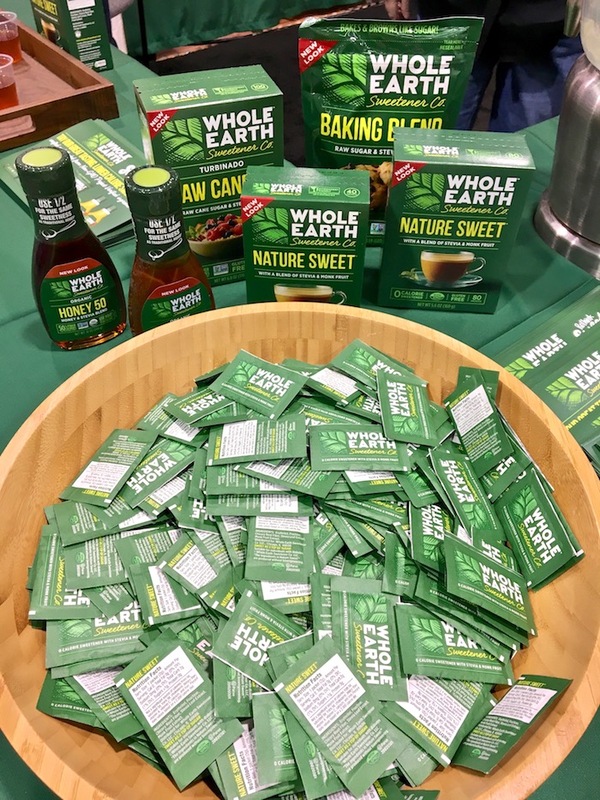 Whole Earth and Sola are playing with blends that include stevia, erythriol and monk fruit. Luckily there was a big emphasis on sustainability at Expo West this year. Alter Eco has been leading the way with some innovative packaging. Their truffles and heirloom quinoa are packaged using compostable materials and non-toxic ink. If that's not a good reason to eat more chocolate, I don't know what is! Vegan Burger has an interesting new line of dry vegan burger mixes. Just add water and presto, you get a tasty burger! The ingredients include oats, beans, brown rice, leeks, bell peppers, tomatoes and other spices. A good idea for a camping trip, or if you're planning a trip to Mars! 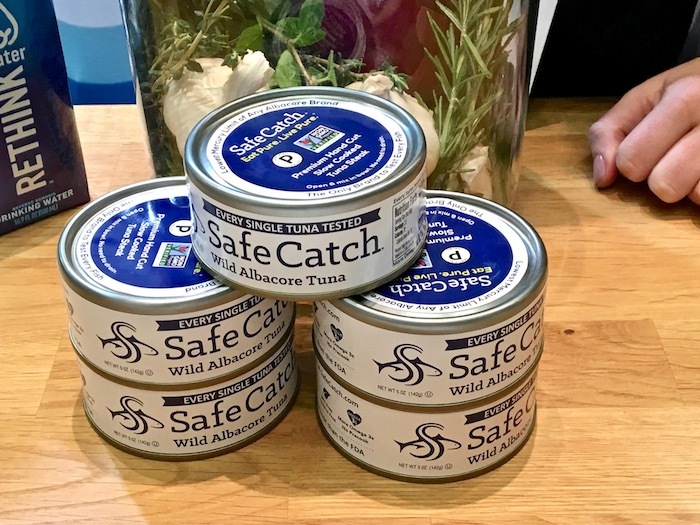 You may have seen Safe Catch in stores already, but you may not have known that they individually test every fish for mercury. Every fish! So of course the fish is wild and sustainably caught. They also abide by a mercury limit 3 times stricter than the FDAs, so you can feel pretty secure enjoying this tuna. So many snacks at Expo West. We're still seeing portable seaweed snacks. I always have a supply of gimMe organic roasted seaweed snacks in my pantry, but there are some new chip ideas from people like Seapoint Farms, but beware of the maltose in their crisps. Chickpeas are also still going strong in the snacking department and I read about Farmhouse's sauerkraut chips, but need to experience them for myself before giving a full review. That's what I took away from Expo West 2017. It's impossible to get everywhere and sample everything, so if you went and tried something wonderful, please share. Until next year!